Parsons & Lumsden is proud to be associated with the City Fleet workshop in Ottowa. This project was a major accomplishment of the City fleet Unit. The R37 million revamp at City Fleet Ottawa Depot is complete and the workshop is now fully operationally. This face-lift is expected to contribute vastly to the productivity of the facility. The Municipality’s Architecture Department, which falls under Engineering Unit and City Fleet Unit recently unveiled one of its major accomplishments, the upgrading completion of the Ottawa workshop. 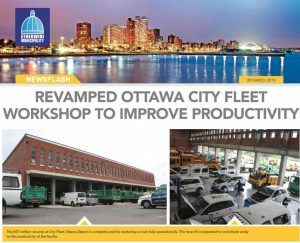 The R36, 5 million City Fleet workshop in Ottawa was designed by Architecture Department and revamped by Tami Construction following a huge need for a bigger and better-quality workshop. He further stated that the newly revamped facility offers high quality working conditions with new machines, improved health and safety conditions. “This was a much needed upgrade to keep the City’s vehicles in safe working order and on the road to attend to service delivery needs.” Joshua thanked everyone involved from designers to contractors in delivering this ﬁrst-rate specialist mechanical workshop to service the City’s heavy duty vehicles with its new top of the range machines. He said employees have already been trained to utilise new machineries. The new building comprised the erection of a new two-storey administration block linking the old and new workshop, upgrading of the site works and parking as well as constructing of an external wash bay. It also features a canteen and changing areas with showers. Acting Senior Manager from Architecture Department, Lungelo Buthelezi said as an implementing agent for City Fleet, they are very proud about the ﬁnal product of the workshop. He added that it is exactly the way they envisioned it. “Our architectural design reﬂects the typology developed and adopted at the Springﬁeld and Mobeni City Fleet facilities. “We aim to integrate the administrative teams upstairs with the workshop personnel for rapid output,” said Buthelezi. Parsons & Lumsden's Ottowa project can be viewed here. Ottawa_Newsflash to download the full original article. Error: Error validating access token: Session has expired on Saturday, 13-Apr-19 02:00:32 PDT. The current time is Thursday, 18-Apr-19 06:03:09 PDT.